I have photographic proof that five years of marriage and kids can dramatically change a person. 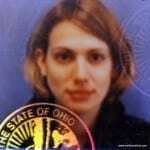 This was my first driver’s license picture taken just a few weeks after Even Steven and I were married. Do you see the hope and optimism? Do you see how I’m glowing? How my eyes are sparkling? This picture was taken just five short years later. We had one child, and I was pregnant with the second. Hah!! Your too funny. … Maybe I shouldn’t renew my driver’s license picture then…. LOL! You look a little like a convict! 😉 You’re still gorgeous! OMG, you are so funny and it’s so true! Your still beautiful though! I was so thrilled that I never had to get a driver’s license photo while pregnant. However, my passport photo looks like I should be on the Do Not Fly list. I actually had to leave the DMV when I wanted to renew my driver’s license because out of nowhere, I started to have a panic attack. I get them like once per decade. I was not worried about renewing my license. I was just sitting there, waiting for my number to be called. And WHAM, sweaty palms, weird breathing, freaking out. So I took my number and ran and had to go back later. So weird. That is hilarious. You still look pretty. Just subdued. LOL! Happy New Year! That second photos looks like one that they show on the news when they want to put a suspect with a crime. Trust me Anna, I have seen 10 years of bad drivers license photos, yours in fine. OooK! We get it, u were once hot and pretty….. Move on and blog! You still look pretty 5 years later! OMG this is so true! I never wear makeup anymore and my hair is always in a ponytail. Anna, your link was the most viewed last week. Congrats! I featured it on my blog today… Love it! You should see MY ID photos over 20 years of marriage.